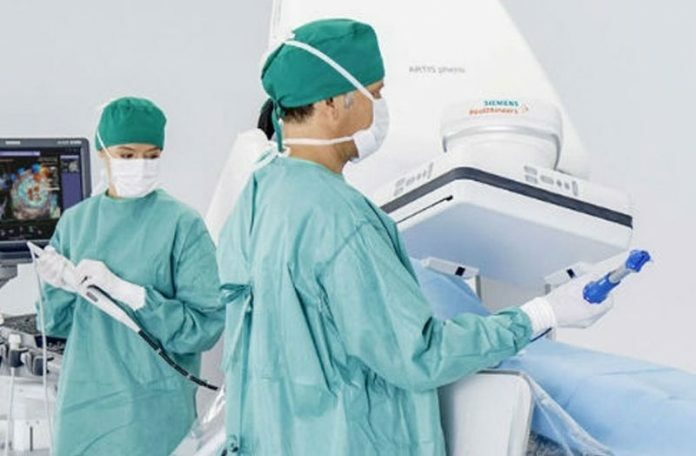 The Food and Drug Administration (FDA) has cleared TrueFusion, a new cardiovascular application from Siemens Healthineers that integrates ultrasound and angiography images to guide cardiac teams when administering treatment for structural heart disease. Available on the new Release 5.0 of the ACUSON SC2000 cardiovascular ultrasound system, TrueFusion is designed to maximize not only interventional cardiology procedures but also routine diagnosis and follow-up of patients with structural heart disease. With cardiovascular imaging applications such as TrueFusion, as well as laboratory and point of care diagnostics solutions in addition to therapy guidance tools, information technology (IT), and services, Siemens Healthineers innovates to improve outcomes and reduce costs in cardiovascular care. Treatment options for structural heart disease are evolving rapidly. Increasingly, these minimally invasive procedures involve multimodality imaging and multidisciplinary clinical teams. To reliably diagnose structural heart disease and perform these complex interventions, clinical teams need detailed, real-time imaging information – specifically, real-time soft tissue and blood flow information from echocardiography as well as 2D imaging information from fluoroscopy – to be visible in one view for common orientation. Addressing the need for fused images, the new TrueFusion application sends anatomical and functional markers as well as valve models from the ACUSON SC2000’s True Volume transesophageal echocardiography (TEE) transducer to an Artis with PURE angiography system, overlaying ultrasound information with live fluoroscopy images to navigate structural heart procedures. By directly and seamlessly integrating co-registration of Artis fluoro and ACUSON SC2000 echo into the workflow via machine learning-based probe detection and automated registration updates, TrueFusion enables clinical teams to identify soft tissue-based structures that are provided directly from the integrated ultrasound system. With TrueFusion, not only can echocardiographers and interventionists better communicate and achieve more intuitive anatomical orientation during challenging procedures, but clinical teams potentially can reduce contrast usage and procedure time as well as patient and clinician X-ray exposure.